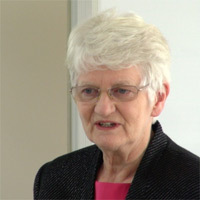 Guest Speaker on this DVD is Dr Kathy Rowe, a top Australian Paediatrician. Over the past 44 years, she has achieved outstanding national and international recognition for her work in adolescent health. Kathy is widely acclaimed as a caring, dedicated consultant physician, in the Centre for Adolescent Health at Melbourne’s Royal Children’s Hospital. She has also held academic appointments in the University of Melbourne’s Department of Paediatrics, involved in teaching, research and clinical work. She is an expert in the area of chronic fatigue syndrome, having worked tirelessly and championed its cause when it was not fashionable. 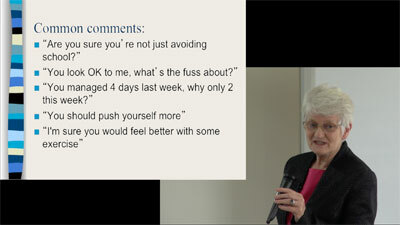 In this presentation Dr Rowe details her extensive study of CFS in juveniles, particularly those of school age. She brings out some of the pitfalls and successes, and some of the practical things that can be done for them, particularly in the areas of education and social adjustment. The powerpoint presentation can be clearly viewed on the DVD. The resources on this website are provided as an information service only. It is not intended to provide medical advice. Every effort has been made to ensure that the information on this website is correct, but the Faithnet Media does not accept any responsibility for action or omission based on inadvertently incorrect information included in recordings listed on this website. It is strongly recommended that persons wishing to use information obtained from this website or from these recordings for decisions about health matters, first consult their medical practitioner.